Here it is, the ultimate in a girls getaway to Las Vegas. Just pack their bags and send them on their way. Following this guide will make the weekend seem like a lifetime of fun! 1. THE hotel: A hotel for the girl’s weekend is easy, THEhotel at the Mandalay Bay is modern, nice and exactly what the girls need to treat themselves to. It is very high end and if you are going to do a good weekend you might as well do it up right. THEhotel is far enough away so that when you want to feel isolated you can walk back to the lounge in the lobby and when you want to crank up the action you head into the casino at the Mandalay Bay. 2. Spa Treatment at the Bathhouse: You will need a Spa Treatment so there is no reason to go anywhere but the bathhouse at THEhotel. There is no worse way to ruin a good day at the spa then getting in a cab and driving back to your hotel. At the Bathhouse you linger for the better part of the day and then you stroll back to your room and get ready for the debauchery that women can create. 3. Socializing at the Social House: During dinner is always important and there is no better way to create that flirtatious environment that women seem to create when they are together than at Social house at the Treasure Island. Essentially, you will have a meal, a few drinks and a little chit chat. Soon the evening will get rolling. 4. VIP treatment at Tao at the Venetian Hotel: The girls get to TAO at the Venetian the vultures will start circling but the best part of Tao is that it is laid in such a way that you can still get free drinks while not being hounded by too many guys. Spend the extra money and go VIP for the girls weekend out and you will not be disappointed. 5. After Hours at Tabu in the MGM Grand Hotel: Night only means that you will hop into a cab and change venues until the sun comes up. Tabu at the MGM Grand is your next option for After Hours dancing and lounging. You most likely would have picked up a few people by now but no worries, that’s part of the fun. 6.Find a pool and rerlax with the girls: The sun comes up, you should get a good spot at the pool. 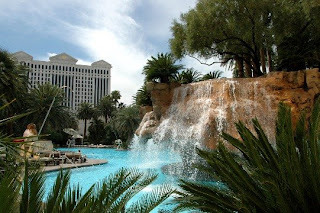 If it was a good night you probably have collected a few hotel room keys so take your pick of the best pools in Las Vegas and recharge for another girls night out.